First thing's first - congratulations to the winner of a jar of White Chocolate Wonderful from Peanut Butter & Co - Jess from Floptimism. You rock! Email me your address so I can get those coupons mailed out to you! Scroll down to find out what the next giveaway is, but first, here comes what I ate...on my 21st birthday! First up: my cake. And cupcakes. I took the cupcakes to my internship this morning - they were a honey cake with lemon curd icing and whipped cream. With a flower made from homemade marshmallow fondant. I also played with fondant on my birthday cake - a lemon poppyseed cake with lemon curd/whipped cream filling and lemon icing. Clearly my fondant cracked and was a little dry, but it was fun to play with! Here is the cake recipe, and here is the cupcake recipe. Here is what I drank! 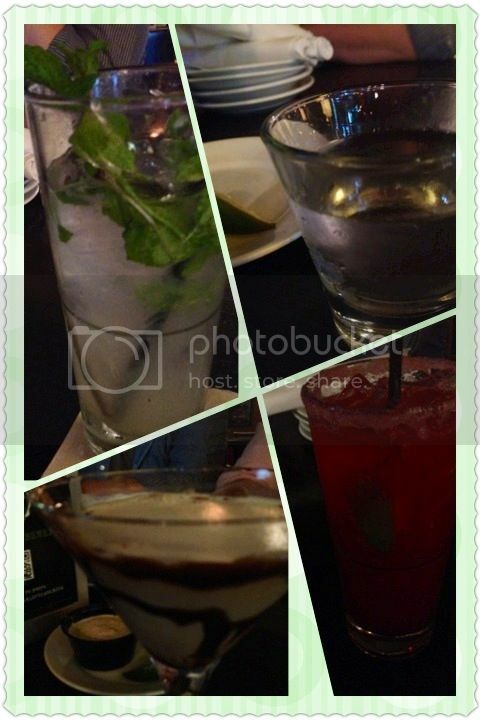 In general: a few shots, some beer, and a few fancy-shmancy drinks. Our waitress was extremely nice and was obviously trying to get me drunk (she filled my shots higher than everyone else's...). Because I forgot to take pictures, I'll just tell you. A Kindle Fire, two $50 Target gift cards, a $50 gas card, and two of my favorite brownies. Yummy. 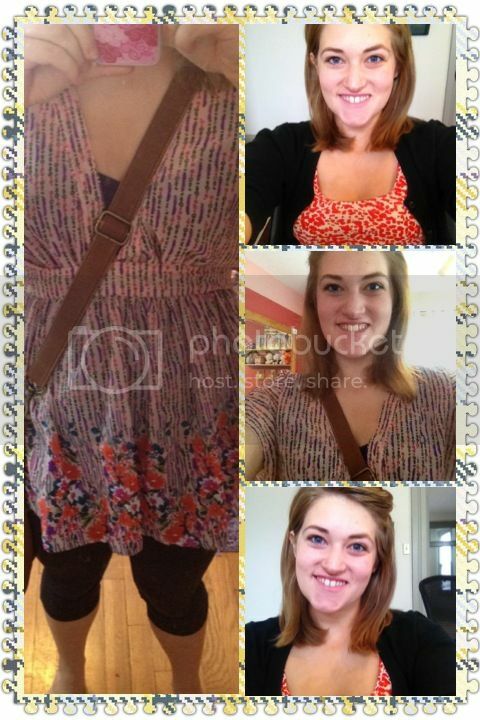 I wore the orange dress to my internship and the pink top with leggings to Bar Louie's! Pretty awesome, right? :) I thought so. I had a really good time! Now, are you ready for today's giveaway? Today's sponsor is So Delicious! I absolutely adore this company. The people are so friendly and their products are super delicious. You can't go wrong with them. One lucky winner will receive a coupon for a free So Delicious product. Anything you want! If you are lucky enough to have their new almond milk products sold around your neighborhood, I highly recommend trying out something from that line. Unfortunately, I am not one of those lucky people :( Oh sad, sad day. I was recently sent 3 free product coupons from them to review their almond milk line, but as I already mentioned, I can't find it anywhere in Cincinnati. So I decided to review 3 of their other products. 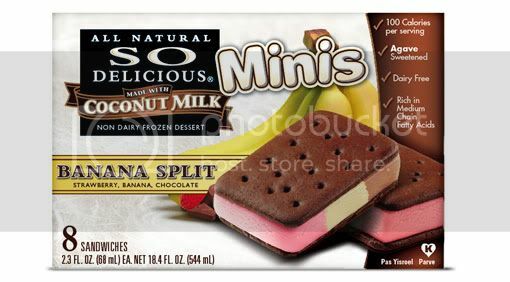 I loved these because they actually tasted like a banana split. And you know what else? Only 100 calories in each one! Yum! These are awesome purely because they are sugar free (sweetened with stevia) and have, I think, 70 calories per pop. Not to mention they were super chocolaty. Passion fruit & mango ice cream! Delish. This was like a tropical party in my mouth. I love fruity ice creams. Now that you have some ideas on how to use your free product coupon, here's how to enter for your chance to win...just a leave a separate comment below for each entry. Thanks! MANDATORY: Follow Passing Daisies and So Delicious on Twitter and tweet the following: "I just entered to win free product from @So_Delicious on PassingDaisies.net. You should enter too! http://bit.ly/nQkq1N #21daysofgiveaways"
THIS GIVEAWAY ENDS TONIGHT AT 11:59 PM EST. i Subscribe to Passing Daisies. i want to see more reviews of gluten free products!!! standing next to watch it grow. The cupcakes are so adorable! so fun!! that cake is gorgeous! it looks professional:) and your magianno's meal looks fabulous -- i love fancy-schmancy drinks....chocolate martini anyone?? :) thanks for sharing! i subscribe to passing daisies! i would love to see more reviews, especially gluten free ones! First of all, your cake came out amazing!! The So Delicious fudge bars and ice cream sandwiches are my favorite-- so delish! And I follow you on Blogger! if adding anything to your blog, just more updates about your outings! those are fun to read about. happy birthday to you. happy birthday to you. happy birthday you old fart, i mean you look great! happy birthday to you! Awesome giveaway! I tweeted and follow both: https://twitter.com/j_mosh/status/210581750550761474 I'd love to try SoDelicious!